The 2012 Tour of Champions Series kicked off on Sunday, July 15 at the Show of Shows in Rockford, Ill., and the excitement continues on Friday, July 20 in Houston, before heading north for the final three series events in 2012. The Tour of Champions features the top eight corps from the previous season, and includes opportunities for fan-member interaction with corps members, pre-show and intermission entertainment and an en-masse finale after the traditional corps performances. Corps participating in 2012 include: Blue Devils, Bluecoats, Boston Crusaders, The Cadets, Carolina Crown, The Cavaliers, Phantom Regiment and Santa Clara Vanguard. One of the highlights of each Tour of Champions event, is a combined finale of the all eight corps' brass sections and color guards. Here's what it looked and sounded like last Sunday in Rockford. View a photo gallery from the Tour of Champions show in Rockford. 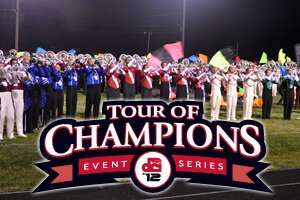 Four more Tour of Champions events are scheduled for the 2012 Drum Corps International Tour. Learn more about the Tour of Champions.